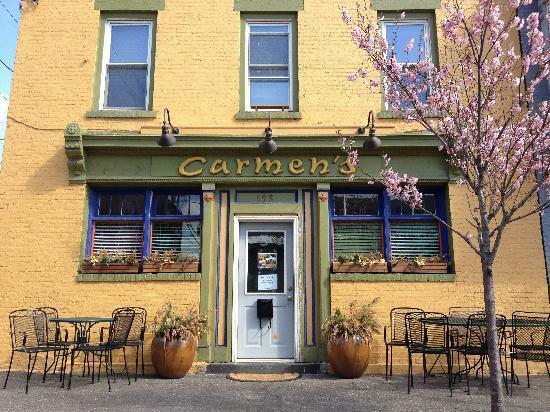 Tucked away from the bustling restaurant and bar area of downtown Troy is a bright and cozy little bistro called Carmen’s Café, located on 1st Street, a good mile or so south of Congress. If you didn’t know it was there, you’d probably never go by it, and that would be a great misfortune. Carmen’s is serving up Cuban-Spanish-American food tapas-style, and combined with the live music and a friendly host, it’s a fantastic dining experience. They serve beer and wine, no cocktails, but they do make several varieties of sangria along with sparkling wine raspberry lemonade. We tried the two sangrias available last night (they let us try them before ordering, a nice touch). The first was a red sangria, flavored with cinnamon – it was rich, fruity, and the cinnamon made it taste like a cross between sangria and fresh apple cider. Needless to say, we got a half-liter; it was so tasty. The other sangria was a white sangria with citrus flavors – it was good, but not nearly as good as the red. We also tried the sparkling wine lemonade, which was tasty but very sweet. The printed tapas menu contains around 10 items, from a manchego cheese and fruit plate, to empanadas, fried plantains, Cuban rice and beans, mushrooms stuffed with chorizo, and fried yucca. The handwritten specials board had another 10 items or so on it, and it changes every week. Last night some of the offerings were Cuban BBQ ribs with a spicy guava glaze, served with yucca fries; a strip steak with churrasco sauce and mashed potatoes; cilantro-lime tofu with saffron rice; and crab cakes with roasted red pepper sauce. We started with the Cuban egg rolls, the chicken croquettes, and the eggplant sliders. The egg rolls were essentially a Cuban sandwich served in egg roll form. The light and flaky wrapper was stuffed with roasted pork, ham, pickles, and Swiss cheese, served with modestly potent mustard for dipping. 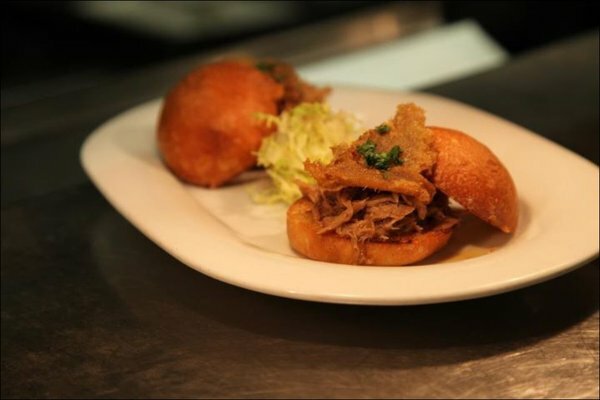 It was really tasty – it was just like eating a Cuban sandwich, but with the delicious fried egg roll crunch. 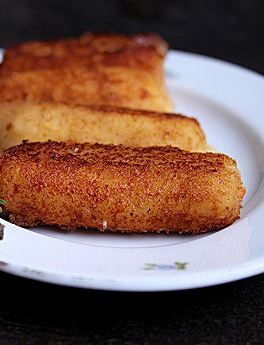 The croquettes were also done very well – diced chicken and cheese were very lightly breaded and fried just enough to crisp the outside, but not give it that heavy, deep-fried taste. The chicken and cheese were creamy and flavorful, and it was served with a nice chipotle remoulade. The eggplant sliders featured two ½-inch thick slices of eggplant topped with a guava sauce and sliced avocado, served on a wheat bun. The eggplant itself was cooked beyond perfect – sometimes people are turned off by thick slices of the vegetable because the texture can be kind of meaty, but chef Chris managed to make these so tender that they just melted in our mouths. The combination of the eggplant with the guava sauce and the avocado was a bit too sweet – it could have used something salty and/or spicy for some contrast. I would love to just have a plate of the eggplant and sauce on its own. A blues duo was playing during our meal, and despite the small space, the music was not obnoxiously loud (and in fact the duo was pretty good! ), and a couple of patrons even made some space in front of the band to dance. We were ready for more food, so we ordered two beef empanadas and the fried plantains. 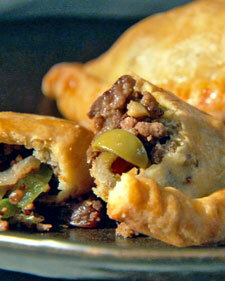 The empanadas were stuffed with seasoned ground beef, raisins, chopped green olives, onions, and peppers (this combination is also known as picadillo). The dough was fantastic – flaky but with just the right amount of chewiness to hold the filling inside, and that filling was full of flavor. The seasoning was vibrant but not overdone, the raisins added a touch of sweetness, and the olives added just a hint of salt and nice texture; these were terrific empanadas. The plantains fooled the heck out of me. They were so fresh and sweet that I was sure they had been cooked in something, maybe a little rum or brown sugar. 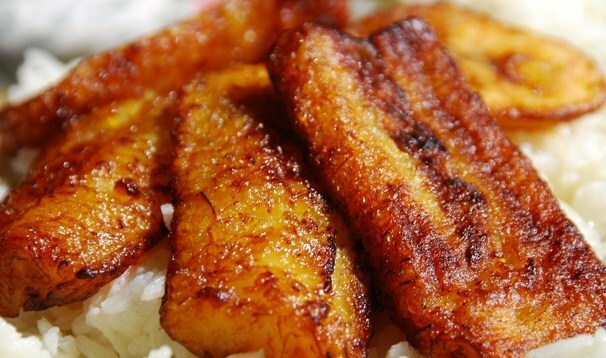 But I was informed that they were just sautéed on their own; that speaks to the freshness of the ingredient and the competence of the chef to just let the plantain sing solo. They were fabulous. There were two desserts on the specials board – a chocolate cake, and mango-lime cheesecake. We really wanted the cheesecake, but unfortunately they had just run out. That was disappointing, but as Mrs. MHK pointed out, at least that meant it was made fresh and they didn’t have extras sitting in the freezer or anything. Arguably the best part of the night was when Carmen introduced herself to us and we talked for about 15 minutes. She told us how she started the restaurant a few years ago, and back then she was the chef as well, running the place from open to close every day. But after a foot injury sidelined her for 8 months, the restaurant nearly went under, and she said if it wasn’t for the neighborhood’s support and encouragement to fix things and stay open, it probably would have shut down. Luckily Carmen found a new chef and for now, the café is only open Friday nights (they do take reservations) and during the day on Saturdays and Sundays (she can only stay on her feet for limited stretches of time). But she plans on opening on more evenings in the near future, and that’s great news for all of us. We talked about the lack of authentic Cuban-Spanish food in the area (she’s part Cuban and part Puerto Rican, so she knows what she’s talking about), and how important it was to her to use fresh, local ingredients. They make their own empanada dough from scratch, they have a smoker for meats including smoking their own bacon for breakfast (guess we need to go for breakfast now), and they get all their cheeses and produce from local farms. As she told us this, we kept nodding our heads and saying, “We can tell!” She was a delight to talk to, and the only reason our conversation ended was because her husband asked her to dance. How frickin’ sweet is that? Why would anyone not want to support a place like this? We’ll be back for breakfast and lunch at some point (click here for the menus and you’ll see why). Prices at Carmen’s are very reasonable, considering the quality of the food and fun atmosphere. The smaller tapas run from $3-$9, and the larger items from last night (remember they change every week) ran from $10-$16. Our total bill, with the sangria and tax and tip, only came to $60 (not including the $5 per person cover charge, which presumably goes to the musicians). Well worth it for an evening of fresh, delicious food, served in a bright and uplifting setting. The Mouse House Kitchen gives Carmen’s Café 4.5 out of 5 stars! A recent day job relocation by the MHK’s Executive Chef has afforded us the opportunity to sample fare from a new (to us) group of eateries in the Halfmoon area of the Capital Region. Many of these locations are on Route 9, which we have decided to nickname “Sandwich Alley.” Along a 2-mile stretch of that road are several sandwich shops, offering freshly made subs, heroes, grinders, hoagies, and just plain ol’ sandwiches. There’s Fred the Butcher, a small market and butcher shop that makes a very good sandwich; there’s Sorrentino’s, an Italian market that also puts together a delicious sub; and standing out from the pack, the King of Sandwich Alley (let’s see if the name sticks), is the Halfmoon Salad and Sandwich Shoppe. Open for breakfast and lunch, their menu contains a huge variety of sandwiches made from both classic deli meats and a good array of interesting combinations of textures and flavors. Located in what looks like a remodeled small house, don’t blink as you drive by or you might miss it. There are only a handful of tables inside, with some picnic tables outside as well. Much of their business is done via take-out, and you can call or fax your order in advance. The staff is really friendly, and despite the crowdedness of the place, it doesn’t take too long to get your food. Among their specialty sandwiches is one with grilled veggies and fresh mozzarella; the “Halfmoon” featuring hot roast beef, cheese and gravy on a garlic toasted roll; an Italian mix with the addition of breaded eggplant; and the three that we have partaken of. The first contained prosciutto, eggplant, roasted red peppers, mozzarella, and a balsamic vinaigrette. The generous amount of salty ham was offset nicely by the sweet and smoky peppers, the fresh cheese, and the tasty dressing. The eggplant was unexpectedly room temperature and not crisp; but it tasted good and added a nice texture. We also tried one with Asian roast beef (flavored with soy and ginger, it seemed), blue cheese, crispy onions, greens, and a garlic aioli, served on foccacia. The beef was really tasty with the Asian flavors, and went perfectly with the blue cheese and aioli. The greens added some nice freshness to the sandwich, topped off with the crunchy onions for some salty goodness. It was a really tasty sandwich. Lastly we tried their version of the Cuban sandwich, with pulled pork, ham, Swiss cheese, pickles and mustard on a pressed roll. Cubans aren’t normally made with pulled pork (usually just roasted and sliced pork), but this was really delicious. The pork was super tender, and all the other ingredients worked well together (just like a regular Cuban). My only criticism would be that the bread got a little too toasty and lost some of the chewiness, but overall it was really good. We also tried our all-time favorite sandwich, plain old roasted turkey with bacon, lettuce, onions, hot peppers, and mayo. The only thing that kept Halfmoon Salad and Sandwich Shoppe’s from being a 5-star sandwich is that they don’t roast their own turkey. Otherwise it was quite good. On the salad side, you can basically create your own salad from a huge list of ingredients, with the usual veggies and cheeses seen at a basic salad bar, but you can also add things like apples, caramelized onions, almonds, avocado, grilled asparagus, sautéed Portobellos, and black beans. The shop also has items hot off the grill like burgers, hot dogs, cheese steaks, chicken/eggplant/meatball parm., and homemade spring rolls like the Buffalo chicken, pizza, or cheese steak. They are also serving up Panini like one with Teryaki chicken; Portobello cutlets; BBQ pulled pork; and one with salami, pepperoni, mozzarella, pesto and garlic butter. For breakfast they are baking fresh bagels and rolls, to go with omelets, breakfast sandwiches (including their signature Lumberjack, which contains eggs, bacon, ham, sausage, cheese, and home fries. Dieters stay away), and French toast. Prices are very reasonable, considering how bulky the sandwiches are (we’ve taken half home almost every time). All specialty sandwiches and Panini are $7.25, and regular deli sandwiches start at $5.25 (but only include lettuce, tomato, onions and dressing, not cheese or other veggies). Yeah it’s just a sandwich shop, but among so many others, it’s a really good one. 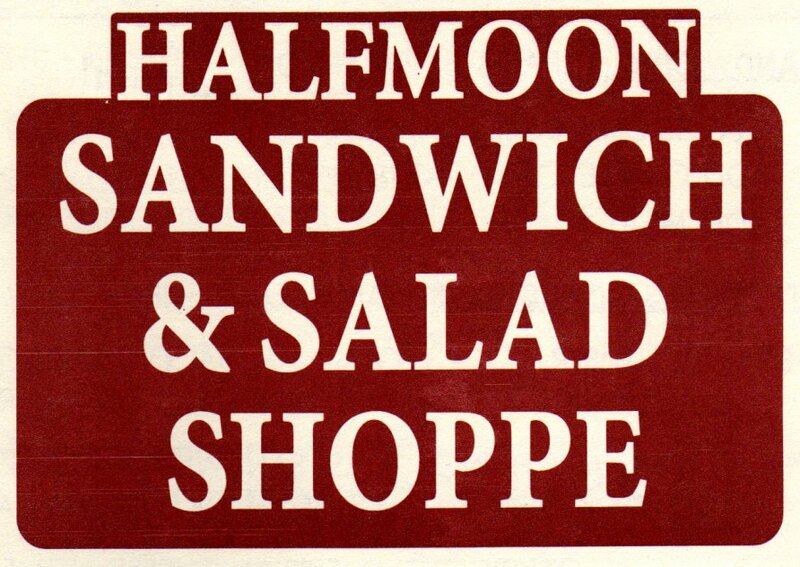 The Mouse House Kitchen gives the Halfmoon Salad and Sandwich Shoppe 4 out of 5 stars! Many people equate the term “family-friendly” in the restaurant industry with “mediocre food.” In many cases that’s very true, but it doesn’t apply to Mangia in Slingerlands. (Interesting aside: if you were to see a restaurant called “Eat,” you’d probably never even think of going there. But if you see one called “Mangia,” which means the exact same thing, you’d probably check it out. Weird.) We had been to their other location in Albany a couple of times and enjoyed the food a lot, but after it closed, we neglected the Slingerlands location for many years. But after two recent visits, not only are we comfortable reviewing the restaurant, we are also comfortable bringing our little ones there. The relatively small dining room features dark wood booths and tables, with natural light streaming in from windows facing New Scotland Ave, along which a covered patio section sits. The somewhat dim interior does have a beacon of anticipated deliciousness – the wood-fired pizza oven. 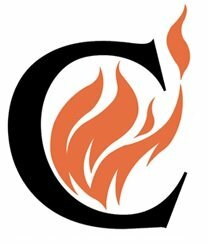 Huge orange flames are visible from the entryway, behind the open kitchen. 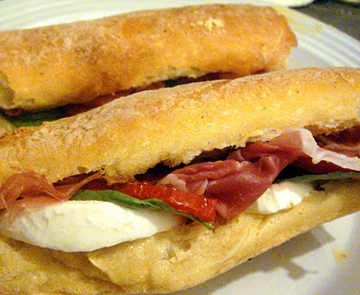 Both the lunch and dinner menus contain essentially the same offerings, although for lunch Mangia features a variety of panini sandwiches, and the portions are slightly smaller for lunch than dinner. Appetizers include bruschetta, fried artichokes, arancini (fried rice balls), roasted meatballs, and eggplant al forno, along with fairly traditional soups and salads like tomato bisque, Caesar salad, and antipasto. But there are a few salads that did look seasonal and interesting like the panzanella with farm bread, mozzarella, and tomatoes; the insalata Portobello features greens with grilled Portobello, sun-dried cranberries, pumpkin seeds and goat cheese; and the spring salad also looked good with field greens, raisins, sun-dried strawberries, pine nuts, and baked mozzarella. We tried the chopped salad and a calamari special. The salad was presented beautifully, a composed mound of Romaine chopped with tomato, cucumber, red onion and Romano crisps, tossed in a Gorgonzola dressing, and topped with avocado, cashews and crumbled Gorgonzola. The dressing was proportionally accurate, no glops of excess dressing clouding the other ingredients, which tasted fresh – the sweet tomatoes and cucumbers meshed nicely with the tangy cheese, crunchy cashews, and buttery avocado. The calamari was tossed in a sweet chili sauce and served over arugula and peppadew peppers. The squid was just a bit soggy from the sauce, which was pretty sweet, but when mixed with the peppery arugula and the slight heat from the juicy peppadews, it was a great combination of flavors. We were served freshly-baked rolls that were absolutely amazing – one could make a meal of those with a salad, easily. Hot from the oven, they were crisp on the edges and ridiculously chewy on the inside, and were served with olive oil mixed with balsamic vinegar; a nice touch. The real downside of our last visit was that we were not shown the sandwich and panini menu, and didn’t even know they had one until we saw other customers being served panini. But the menu did look good, with offerings like the vegetable stack with fried eggplant, squash and zucchini with mozzarella; the chicken, bacon and avocado Panini, the sliced sirloin with onions, peppers and blue cheese on ciabatta, and the stuffed Portobello burger. 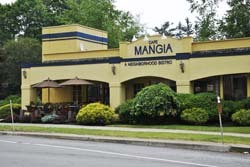 Mangia’s entrees are also fairly traditional for Italian food – pastas with marinara, pesto, pomodoro, carbonara, and a la vodka sauces are offered, along with grilled chicken, shrimp, and sausage; other entrees include lasagna, chicken piccata, salmon, steaks, halibut, and chicken marsala. But the real reason to eat at Mangia is the pizza. Anytime you have a wood-fired oven, it’s hard to make a poor-tasting pizza, and Mangia doesn’t disappoint. They offer a few pre-conceived combinations, but with 39 toppings to choose from, you can make your own masterpiece. On recent visits we had three different pizzas: pepperoni with ricotta, mozzarella, provolone and blue cheese; prosciutto with sun-dried tomatoes and smoked mozzarella; and sausage with pesto and blue cheese. All three were extremely delicious. 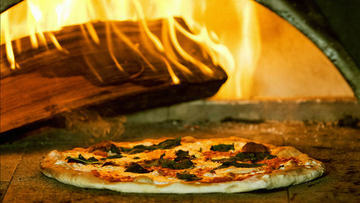 Those wood-fired ovens make the perfect crust – thin but sturdy, with just the right amount of chewiness. The ingredients all tasted fresh and looked beautiful coming out of that super-hot oven. Other interesting toppings to consider include eggplant, zucchini, caramelized onions, hot cherry peppers, pine nuts, and barbecued chicken. Mangia knows its clientele – it’s situated in an area with a lot of families, but they did not sacrifice anything for a kid-friendly environment. 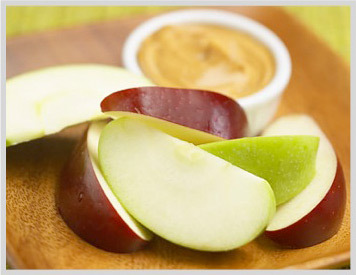 All you really need to know is just by looking at the first item on their kids’ menu: sliced apples with peanut butter. I mean, for parents of a toddler, how much more can you ask for? It’s only $3, and for the peace and quiet it brings, it’s worth so much more. The MHK highly recommends that all restaurants that welcome children offer this menu item. They also have pizza and pasta for the little ones, plus really good chicken fingers – these are not frozen with that thin bread-like coating on the outside. These are freshly made and taste like grandma’s fried chicken (if your grandma is Paula Deen or someone like that). Mangia’s prices are fairly reasonable, especially for lunch. Soups, salads and appetizers range from $4-$14 (some of the salads are offered in lunch or dinner-sized portions), pizzas run $12-$15 generally, but the price goes up with every topping you add; sandwiches will set you back $9-$12; pastas range from $7-$20 (again you can choose portion size on several of them), and entrees go from $14-$22. The kids’ items are all $6 or less. Quality food in a family atmosphere – if that’s what you’re looking for, look to Mangia. The Mouse House Kitchen gives Mangia 4 out of 5 stars! When the MHK first set down roots in Albany, NY seven years ago, there seemed to be a dearth of quality ethnic food options, save for Indian and Vietnamese. But over the last few years, things have changed. A couple of years ago a fantastically delicious and authentic Chinese place opened, and as we mentioned in a recent post, we now have a very good taqueria-style Mexican joint. The Thai options still remain hit-or-miss, though we had come across one that did at least some dishes very well. 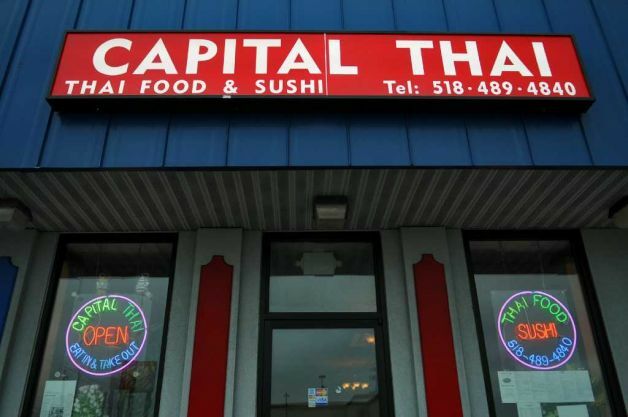 But last week we tried Capital Thai – we heard good things about it (mainly from people who grew up around here, so we were a bit skeptical), and as it turns out, the dishes we sampled were very tasty and very authentic. Pretty soon all we’ll need is a Moroccan place and we’ll be golden. Capital Thai seems a little fancier than it is – white tablecloths adorn the tables, even at lunch. The décor is minimal with images of Thailand on the walls – but it’s a nice, inviting space. We were handed a fairly extensive menu to peruse, along with a separate sushi menu. I don’t know what it is about all the Asian restaurants around here feeling like they all have to have sushi, even in a place that should be strictly Thai – I guess sushi makes money for some reason, regardless of where you are eating (though I will happily note that Van’s does not offer sushi, and I hope they never will). The appetizer menu at Capital Thai is also spread all over the map – classic Thai dishes like chicken or tofu satay, shrimp cakes, and fried tofu are on there, along with Japanese dishes like gyoza and tempura, and a nod to India with the samosa offering. We started with the fried tofu, served with a plum-peanut sauce. The tofu was cooked perfectly, golden brown and firm on the outside with a fluffy and tender middle. The dipping sauce was also very good, salty from the peanuts but very sweet as well – a little of the hot chili sauce they brought to the table made it a very appetizing appetizer. 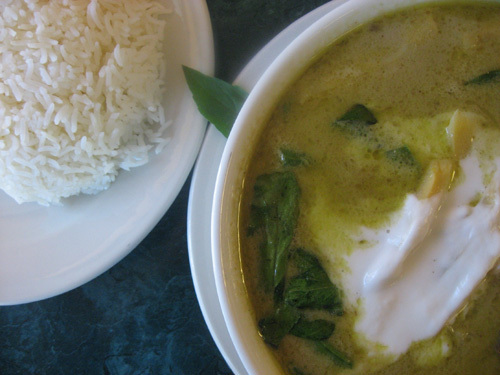 Among the soup offerings are tom yum goong (hot and sour shrimp and lemongrass), tom ka gai (chicken soup with coconut milk), and the glass noodle soup. It was a warm day so we eschewed the soups and turned our attention to the salads, among which include the very authentic som tom (spicy papaya salad) and the larb gai (spicy Thai chicken salad), along with the yum woon-sen (mungbean noodle salad) and of course the traditional American-ized Thai garden salad. We are big som tom fans, so we had to see how Capital Thai’s version was – and it did not disappoint. The sweet papaya could have been a little more firm, but otherwise it was superb. Upon ordering, our server asked us how spicy we wanted this dish, to which we of course replied, “SPICY!” And they did not Albany-ify it for us – they brought the heat, and it was delicious. The crunchy bean sprouts, the acid from the tomatoes and lime juice, and the salty fish sauce created a wonderful variety of flavors on the palette. It was topped with dried shrimp, something we hadn’t seen on this dish before, and in the future, we’ll have them omit it. In southern Thailand, according to our server, this dish is traditionally eaten with these firm little shrimps on top, while in northern Thailand they put anchovies on the dish instead. But aside from that, our lips were burning in a very welcome manner. 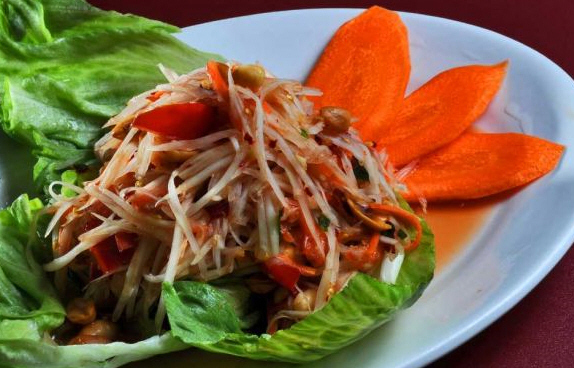 Entrees at Capital Thai run the gamut – curries, fried rice, noodles, seafood, and duck dishes abound, assuring there is something for everyone. Interesting-sounding dishes we didn’t try include the spicy eggplant with basil, the garlic fish, the crispy half duck, and the classic Mussamun curry with meat, peanuts, potato and onion. We did want to try one of the curries, so we went with green (they also have red and yellow in a couple different varieties). Bamboo shoot, bell peppers, basil, pork, and coconut milk made up Capital Thai’s green curry – the flavor was quite good, the pork was very tender, and the broth was pretty thick and creamy; creamier than we’d seen before, and in fact was probably a little too creamy – the dish was very rich, not what you’d expect from Thai curry. But it just meant leftovers for the next day. 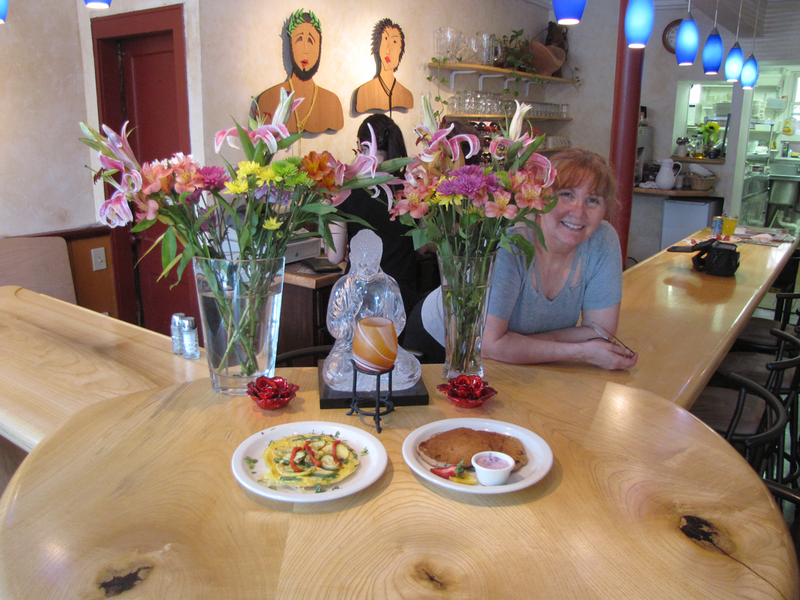 Mrs. MHK is a big Pad Thai fan, and in our seven years here, she has gone unsatisfied in that department – until now. 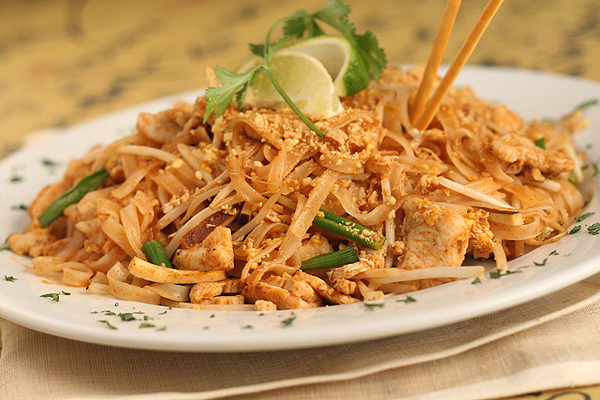 Pad Thai is a national dish of Thailand, made popular in the 1930’s and 40’s, and is probably the most well-known Thai dish in the U.S. A lot of foodies tend to snub their nose at the dish, thinking it has lost its authenticity as it gained popularity. But when it’s done right, it’s very tasty, and Capital Thai does it right. Noodles are mixed with tofu, bean sprouts, egg, and peanuts and sometimes a meat (we got chicken on this occasion) – the sauce is where many places fail at the dish, making it too sweet and/or thick. But Capital Thai’s was great, just slightly sweet and lightly tossed with the noodles, enough to bind the dish together but still let the individual ingredients shine. We were very pleased. Capital Thai’s prices are fairly standard for Thai cuisine – appetizers range from $4-$8, soups from $4-$10 (many soups are offered in small or large sizes – the large ones go up to $15), salads from $4-$10, rice and noodle dishes range from $8-$12, and entrees go from $9-$22 (the upper end of the scale are for dinner-sized portions). We are excited to go back and try more dishes at what seems to be a terrific addition to the growing quality ethnic food market in the Albany area. The Mouse House Kitchen gives Capital Thai 4 out of 5 stars! There has been a food movement of late wherein restaurants advertise that their food comes from local farms, butchers, and dairies, presumably to appeal to those who care about that sort of thing. It makes the restaurant look like they care about the quality and freshness of the ingredients they use, which can then make the diner feel like they are getting a good meal and supporting their local community. But of course none of that matters unless the dishes taste good; and the truth is…they are absolutely correct. 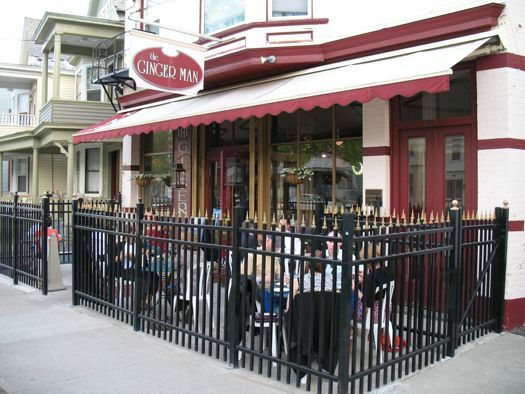 Case in point: the Gingerman, located in Albany’s Pine Hills neighborhood. It’s an institution of sorts, featuring a famously extensive wine list (they also have their own wine cellar), and an eclectic menu featuring products from local vendors (which we learned first-hand, as you’ll read about shortly); and the food is quite good, served in a pleasant atmosphere. We sat outside on a very comfortable evening a few weeks ago, and perused the aforementioned wine list, along with a very disappointing beer list (disappointing because the owner of the Gingerman also owns Washington Tavern just a few paces up the street which has a very nice beer selection). We settled on one of the wine “flights” they offer, a trio of reds that were mostly good – one of them was not very appealing, but our server replaced it with another one with no fuss. The Gingerman’s appetizer menu includes mushrooms stuffed with sausage and Romano, fried calamari topped with pico de gallo, risotto crochettes stuffed with parmesan cheese, and lobster cakes with a lemon-chive butter sauce. 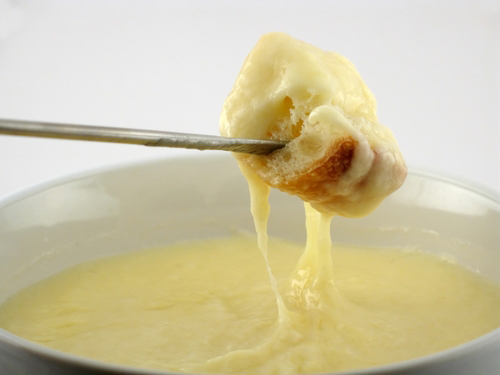 We opted for the cheese fondue, featuring a small pot of melted Irish cheddar blended with Guinness beer and served with garlic toast for dipping. The cheese was so rich and flavorful that we assumed there was more than one kind of cheese in it, but our server corrected us. For health reasons we probably shouldn’t have polished off the whole thing, but it was really tasty. We also tried the tuna tartar, served with a cucumber-pepper slaw. The tuna was very fresh and tender, but it was quite dry – a light soy-based sauce of sorts would have been well-advised. Somewhere between the appetizers and entrees came the accidental entertainment portion of the meal. A man sitting at the table next to us was talking fairly loudly with his friend, and we learned that he went to the Gingerman all the time, knew the owner, and was very into local food. He chatted up the server about the Gingerman’s apparently new chef, and soon after the chef came out and sat down with this man and his friend. They proceeded to have a long conversation about the Gingerman’s history vis-à-vis the previous chefs, and how this new guy was approaching the menu and food in general. We learned from the chef that he buys as much as he can from local farms and dairies, including a whole goat he had just purchased in advance of a Mediterranean wine pairing menu that was going to be featured the following week – he was going to make braised goat empanadas. We were also indirectly informed that you can’t buy goat segments around here, just whole goats. The entire conversation was fascinating to a foodie like me, and only slightly annoying that it went on so long. But something good did come out of it – the chef brought out a sampling of the braised goat for his new friends, and shortly thereafter when our server was bringing our entrees, we half-jokingly expressed that we felt jealous and left out for not receiving the chef’s generosity as our neighboring table had. A few minutes later the chef brought us some braised goat as well – a classy move, and better yet, the goat was really, really good. For entrees, the Gingerman features lighter fare like the chilled vegetable tower, the lemon-pepper chicken sandwich, and the lobster burger. They also have heartier dishes like NY strip steak, red snapper in a lemon-thyme broth, tuna au poivre, duck meatloaf with onions and mushrooms, and lobster mac n’ cheese. We went with the vegetarian pesto risotto and the duck sliders. The risotto was mixed with celery, carrots, and onions and topped with an arugula-tomato salad. The rice was cooked perfectly and the vegetables were tender and delicious; the salad on top, tasty as it was, didn’t really compliment the risotto. It should have been served on the side; the other criticism we had was that the dish could have used a sprinkling of cheese, but all in all it was a nice plate of food. The duck sliders featured a thick slice of duck meat cooked in a port wine reduction and topped with brie cheese, sandwiched between toasted brioche. The meat was tender and flavorful, and the brie added a great creamy texture to the dish (though a bit more brie wouldn’t have been a bad thing), with the wine reduction enhancing the flavor of both the duck and the cheese. It was very good. The dessert menu wasn’t overly interesting, featuring items like cheesecake, chocolate fondue, and crème brulee, but we were in the mood for a sweet finish, so we opted for the Guinness chocolate cake with an Irish Cream frosting. The cake was moist and rich, but the Guinness was undetectable, and the frosting tasted like plain old vanilla frosting. But it still hit the spot. Prices at the Gingerman are quite reasonable for a nice night out – appetizers range from $8-$17, lighter entrees go from $10-$18, and the larger entrees range from $20-$28, with desserts going from $6-$9. Fresh ingredients that are well executed in interesting combinations make for a deserved trip back to the Gingerman. The Mouse House Kitchen gives The Gingerman 3.5 out of 5 stars! Nearly two years ago, we posted about a strange banner that had appeared on the side of a run-down former restaurant, advertising that a Brazilian steakhouse, or churrascaria, was coming to our little town. Well, two years later that banner has disappeared and the building remains an eyesore. 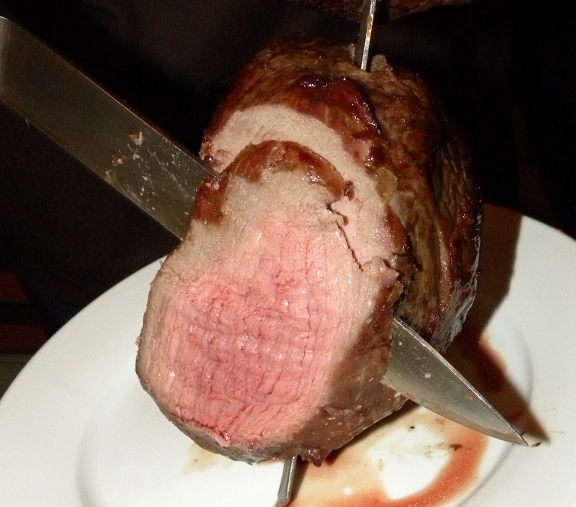 But recently a churrascaria did open up in downtown Albany – Carmine’s Brazilian Grill. With great anticipation and high expectations, we visited Carmine’s several weeks ago. But unfortunately our expectations were not met. Carmine’s was quite inconsistent with the quality of the food – however, it’s still a fun place to spend an evening. Just temper your expectations. If nothing else, Carmine’s is a classy place. We were greeted by a large doorman/bouncer who invited us to enjoy our evening – it felt very posh. The atmosphere inside is very pleasant – orange walls and dark wood furniture created a simple, contemporary design that felt warm and inviting. The small bar has large windows looking out on Sheridan Avenue, and there was a small crowd on a Saturday evening. We were seated fairly quickly, and our server explained to us how the Carmine’s experience works. It’s a fixed price per person, and the food is all you can eat. There is a “starter bar” consisting of about 30 appetizers, which we helped ourselves to after ordering a round of drinks, including a few varieties of caipirinhas, a national drink of sorts of Brazil – it’s similar to a mojito, with a rum-like liquor and muddled mint and lime. They also had a pineapple variety and a mandarin orange version. All three were good, but the orange one stood out with great flavor. We also tried their sangria, which was also very tasty. The starter bar contained both hot and cold items from a variety of nationalities – Italian, Spanish, American, Brazilian, etc. The items are not listed on any menu – there are small signs next to each plate letting you know what they are, and unfortunately at this time (being that we were there a month ago) we can’t recall very many of the items offered. But we do remember this – about half of them were not worth getting. 30 items is quite a lot, and had they focused on maybe just 15 or 20, the lack of quality in the other 15 items may not have been so prevalent. But we were having a good time, and looking forward to what churrascarias are known for, the giant skewers of grilled meats. Every diner is given a card – one side red, one side green. When you are ready to be served, you flip your card to green and servers begin bringing you the food. Carmine’s list of meats changes, but they usually have 12 to 15 different things to try. We had three different kinds of steak, two different kinds of chicken, turkey wrapped with bacon, sausage, shrimp, two different kinds of pork, lamb, and grilled pineapple. All the items are carved off of large sword-skewers by a myriad of servers – some of the servers seemed to be enjoying their job, while others seemed to be annoyed with the task. But it was entertaining, and certainly a unique dining experience. 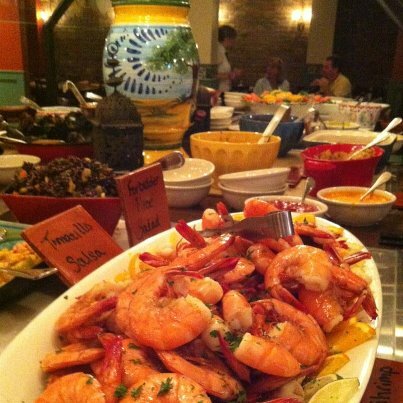 But just like the appetizers, only about half of the dishes were of good quality. Most disappointing were the steaks, which should have been the star of the show. But there was no seasoning, no flavor to them – it was so disappointing. The pork dishes were ok but nothing to go back for; the lamb was bland like the steaks; and the shrimp was overcooked. The standouts were the chicken offerings, the turkey, and the pineapple. They were juicy, tender, and were seasoned just right, even the pineapple. The dessert menu looked fantastic, so we indulged. They were offering a sampler trio of desserts, which sounded like a good idea. We tried the chili and chocolate pudding (which was more mousse than pudding), and the two other items escape me; all of them were ok, but again, not really worth coming back for. Carmine’s charges $32 per person, which in spite of the inconsistent quality of the food is not a bad deal – we were there for over two hours, and had a good time just enjoying the variety of dishes and drinks. But because of the quality issues, we won’t be returning any time soon. The Mouse House Kitchen gives Carmine’s Brazilian Grill 2.5 out of 5 stars. You’ll Be Glad You Chose Bros. When Bros. Tacos opened 6 years ago, us California transplants rejoiced at the addition of semi-authentic Mexican food in a taqueria format to the Albany area. The two brothers who opened the restaurant had toured around the Southwest getting ideas and ingredients for their taco eatery, so we were very hopeful. Quality-wise, it was good for a few visits, but after a while it got a little stale and the novelty wore off. We avoided Bros. for many years, but after hearing that they revamped their menu and made some changes with their ingredients and preparations, we gave them another try…and it’s rejoicing time once again. 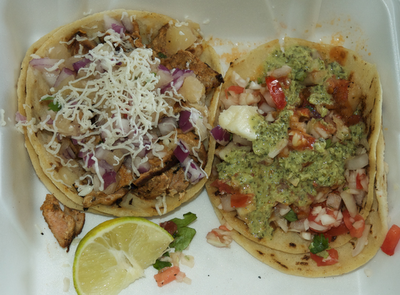 Bros. Tacos is now serving fantastic taqueria food consistently, and we couldn’t be happier. Their selection of tacos hasn’t changed too much – you can choose from chicken, steak, shrimp, fish, veggie, ground beef, in a variety of sauces, served on homemade corn tortillas. New varieties include pineapple shrimp, “Yaki” chicken in a teriyaki sauce with corn and beans, homemade chorizo – yes, homemade chorizo – salmon, and Portobello mushroom. The ingredients are fresh and delicious, made to order every time. You can choose from the same fillings for their burritos (which are quite large), and Bros. now features an extensive list of homemade salsas. Other new menu items include homemade tamales, empanadas, tortas (Mexican sandwich), and enchiladas. On recent visits we have tried the ground beef empanada, chicken enchiladas, ground beef torta, pork torta, chorizo tacos, and a chicken burrito. Everything was spectacular. The empanadas were full of flavor, fried to the perfect crispy and chewy texture to house the savory ground beef mixture. The enchiladas were very tasty, the perfectly cooked chicken in a red sauce with cheese and seasoned with care. 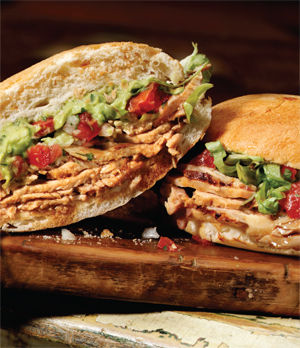 The tortas were topped with tomatoes, pickled jalapenos, avocado, and a lime mayo, then grilled like Panini – the meats were tender and juicy, and the toppings added a fresh dimension, creating a marvelous sandwich treat. The chorizo tacos were also very good – any time you can get homemade chorizo it’s a blessing. It was succulent and spicy, topped with pico de gallo and tomatillo salsa – simply delicious. The burrito was filled with beans, rice, chipotle sour cream, guacamole, and red salsa – it weighed a ton but the flavors were perfect, like an authentic burrito should be. A must-have at Bros. is their corn on the cob. 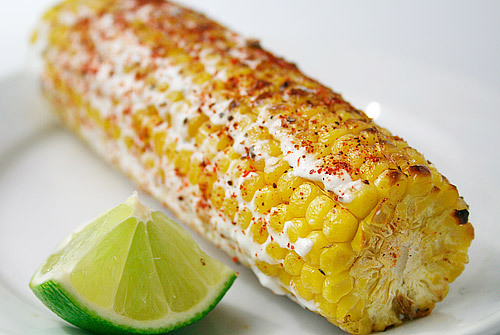 Those who have lived in areas with large Latino populations are probably familiar with the street vendors who sell corn on the cob topped with a variety of ingredients, from cheese to mayo (yes, mayo), salsa, butter, and many others. Bros. has recreated this tasty treat, topping their tender corn with lime mayo, cotija cheese, and a very spicy chili powder. Years ago the corn was good, but had no spice to it. Now it’s utterly fantastic, but unfortunately it’s only available when corn is in season. Prices at Bros. are very reasonable – burritos range from $6-$9, tacos run $3 apiece (you can get two tacos with rice and beans for only $6.75), and the tortas, empanadas and enchiladas are all under $7. It is far and away the closest thing to a real taqueria in the area, and we are lucky to have it. The Mouse House Kitchen gives Bros. Tacos 4 out of 5 stars! You are currently browsing the archives for the Restaurant review category.